For example, you may have a ‘my account’ page shown on the URL yoursite.com/my-account. When the endpoint ‘edit-account’ is appended to this URL, making it ‘yoursite.com/my-account/edit-account‘ we show the Edit account page instead of the My account page. This allows us to show different content without the need for multiple pages and shortcodes, thus reducing the amount of content we need to install. 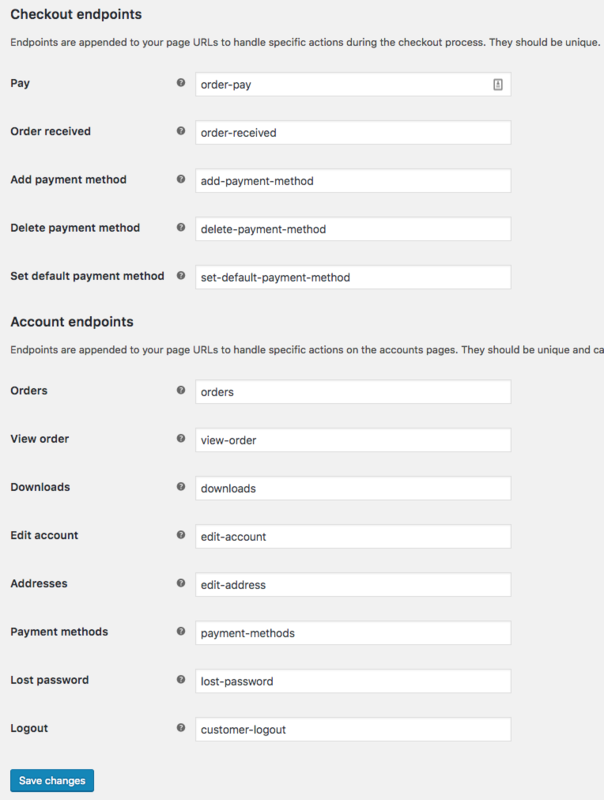 By default the endpoints are already set up WooCommerce > Settings > Advanced in the Page setup section. The URL for each endpoint can be customized inWooCommerce > Settings > Advanced in the Page setup section. Ensure that they are unique to avoid conflicts. If you encounter issues with 404s, go to Settings > Permalinks and save to flush the rewrite rules. 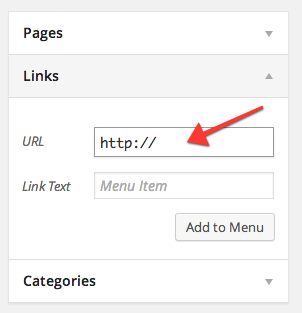 Enter the full URL to the endpoint and then insert that into your menu. Remember that some endpoints, such as view-order, require an order ID to work. In general, we don’t recommend adding these endpoints to your menus. These pages can instead be accessed via the my-account page. Gateways need to use these methods for full 2.1+ compatibility. If you see a 404 error, go to WordPress Admin > Settings > Permalinks and Save. This ensures that rewrite rules for endpoints exist and are ready to be used. If using an endpoint such as view-order, ensure that it specifies an order number. /view-order/ is invalid. /view-order/10/ is valid. These types of endpoints should not be in your navigation menus. Landing on the wrong page when clicking an endpoint URL is typically caused by incorrect settings. For example, clicking ‘Edit address’ on your account page takes you to the Shop page instead of the edit address form means you selected the wrong page in settings. Confirm that your pages are correctly configured and that a different page is used for each section.